"Big Daddy D" Lattin provides quality and quantity sports apparels at affordable prices. When it comes down to basketball, it is hard not to think of Hall of Famer David “Big Daddy D” Lattin! 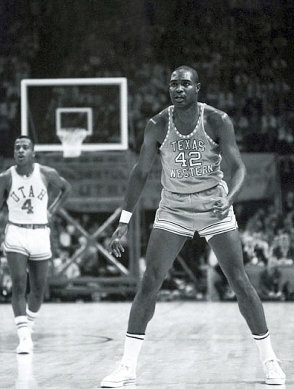 Inducted into both the Naismith Memorial Basketball Hall of Fame and Texas Black Sports Hall of Fame in 2007 for his part in winning the NCAA championship on March 19, 1966 with the Texas Western Miners. This victory was a monumental victory that changed the way America thinks of basketball. This victory was forever enshrined in 2006 in the film Glory Road. And with David Lattin’s book Slam Dunk to Glory, you can experience the events of the 1966 NCAA championship through Big Daddy D’s first-hand experience. Our products can be delivered to any community, city, and state in the country. Basketball is for everyone so our products will find its way to you. Know someone who is a David Lattin fan? Refer them to our website! Check out some photos of Hall of Famer David “Big Daddy D” Lattin. Schedule an appointment today. We look forward to meeting you soon. The 1966 NCAA Championship did not only change basketball forever but it also changed America. Considered as a turning point in the Civil Rights Movement, this was a monumental time in American history. David “Big Daddy D” Lattin wrote Slam Dunk to Glory to recount his personal experience and part in the basketball game that people still talk about today. Get your own copy of David Lattin’s book. Order online now and read about his journey of becoming one of the most celebrated athletes in history. Choose from our wide range of basketball apparel, accessories, and shirts. Feel free to browse our online catalog.